It’s throw back Thursday, and for once, I have found a gem to write about amidst the sea of celebrity baby photos. This past week, dancer-turned-actress Julianne Hough shared a series of #TBT pictures revealing her foot in a thick black cast. The actress was also walking on crutches at the time of the injury. Captioning her images on Instagram, she wrote: ““When I tore a ligament in my foot almost 2 months ago! Thank heavens for (my doctor) who whipped me back in shape with no surgery needed! 4th day of working out since it happened… Man does it feel good to be back on the grind!!! Wahoo!!! Ligaments are the fibrous tissues that connect our bones at the joints; a torn ligament in the foot is considered to be a badly sprained foot. Signs of a sprained ankle include pain, swelling and possibly bruising at the site of the injury. Grade I is a stretching of the ligament or a very minor tear to it; the stability of the joint is minimally impacted. Grade II involves a more serious but still not complete tear of the ligament. Grade III is an injury where the ligament is completely torn or ruptured. The injury can feel as bad as a broken bone, since it’s usually impossible to put any weight on a Grade III sprained foot. 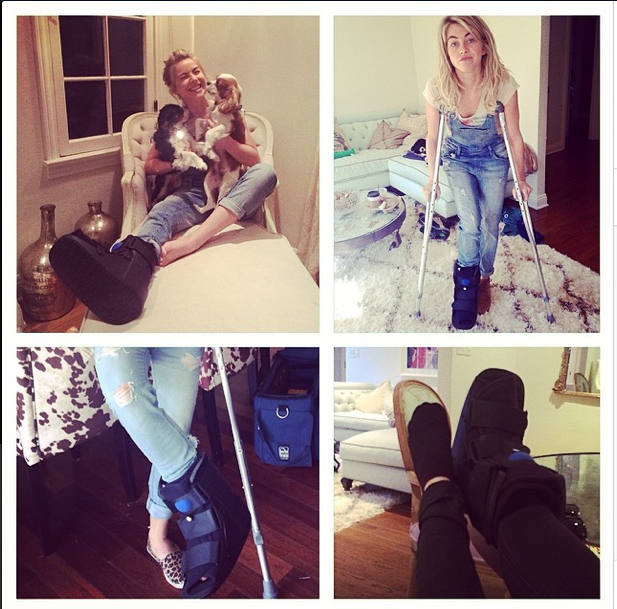 From the sounds of it, Julianne Hough had a Grade III sprain, which would mean that her 2 month recovery period is inline with what patients in my Houston podiatrist office experience. If you believe you have sprained your ankle, schedule an appointment with Dr. Andrew Schneider immediately so you can enjoy the quickest possible recovery time.